2008 Xiaguan "XY Yiwu Zhengshan Laoshu"
Call them what you will, they are often but shadows of the real thing! Guangzhou is famous for its merchants, and has been for centuries. One of the more modern incarnations of this trade, one Mr. Ye Binghua, seemingly commissioned this "recreation" of Menghai's (in)famous Big Green Tree - by which we are to assume the 1999 Red- or Blue/Black-labelled variety. If I close my eyes, I can just about bring the taste of those "BGT"s to mind, which makes for an interesting comparison against this modern-day homage / knock-off. The cake is lightly compressed - my sample (from Yunnan Sourcing) appears to come from the outer edge. Small and dark, I see stems and few buds. It looks very Xiaguan (small, mulched), and not at all like the original BGTs (see the links above for reference), so already we have a point of departure. The aroma is good: sweet and dark, perhaps a bit dusty. Amazingly enough, the initial aroma smells just like that of the 1999 and 2003 versions! I don't know how they did it, but they did it. It has a strong attack that swiftly fades into sweetness, all rich, dark, wet woods. A delicious and tantalising start. It's actually rather a nice tea in its own right, but it tastes like a "Xiaguan special", and not at all like BGT. After the aroma, I thought they'd cracked it - but the flavour is a giveaway. That standard, now expected, Xiaguan black richness runs throughout this tea, giving it a savoury, tobacco edge. I rather like that modern Xiaguan addition, which I assume they achieve through some cheeky pre-fermentation, given that virtually all of their specials have a trace of it, to some degree or other. Like all those Xiaguan specials (and I feel as if I've had several hundred of them throughout 2008), it is good, but limited. It is capped at some invisible ceiling, perhaps brought about by whatever means they achieve that dark, tobacco addition. I enjoy modern Xiaguan blends, but I go into it with my eyes open, in the understanding that some long-term prospects have probably been sacrified in order to make these leaves more immediately compelling. 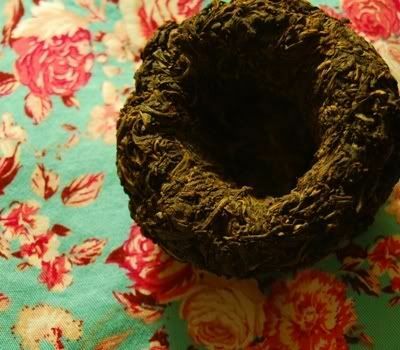 Xiaguan have learned how to avoid extremes, which is a good thing if you want to avoid dire teas, but perhaps less good if you want to sample greatness. 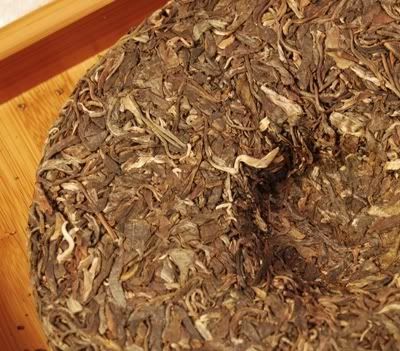 It's absolutely nothing like Big Green Tree (except for that uncanny aroma), and it's certainly not Yiwu Zhengshan Laoshu [proper-mountain, old-tree], but it is a pleasant Xiaguan special production of the kind with which we're all probably very accustomed by now. It's not big, nor is it a tree, but it is, at least, green. Much the same could be said of this 2008 XY production. Everywhere, the aroma of spring. 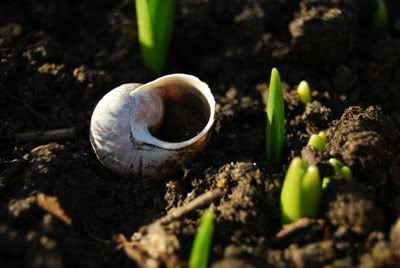 I step out into the garden and realise that, while I have been buried in simulations, writing, and redecoration, the world is changing, and everything is starting all over again. I'm really looking forward to having my life returned to me, after final submission of my work. After so many years, I don't think I'll be able to comprehend what's it like not to have the burdens of a degree weighing on my mind. This tea harks back to the mild spring of 2008, kindly provided by Nada. 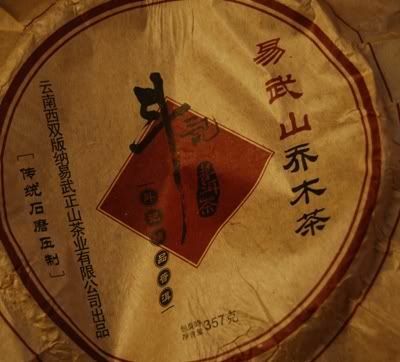 I consider it to be the twin of the delicious 2008 Laobanzhang maocha that provided such a valuable insight into the character of actual "LBZ": purity, power, plenty of mushrooms and sweetness. I recall from Nada's travellog that the town of Laobanzhang [Old Banzhang] takes its security rather seriously, searching all those that enter and leave the settlement to ensure that only local leaves are sold as "Laobanzhang". The next town over is called, rather imaginatively, "Xinbanzhang" [New Banzhang], and this maocha is a second flush selection from there. I've said it before, and I'll say it again: I love maocha. 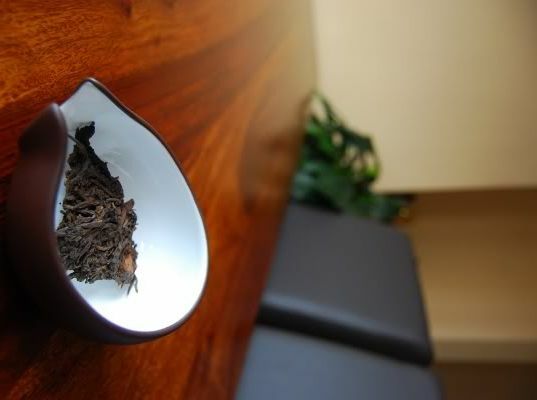 What a great way to enjoy pu'er: unadulterated, unprocessed, untampered. 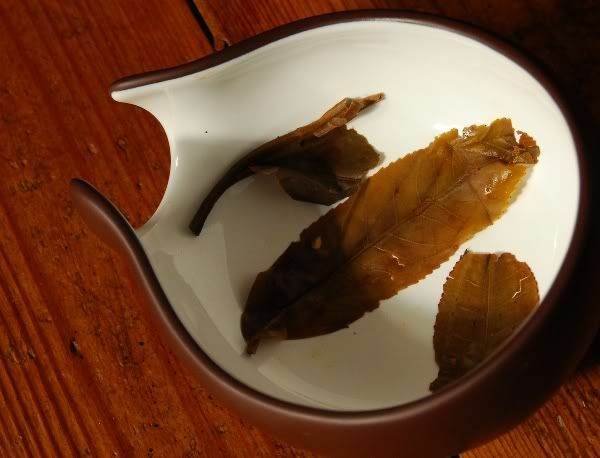 Just straight, honest pu'er leaves. They are a joy to behold, as pictured above, in all their furry finery. These particular leaves are pungently sweet. 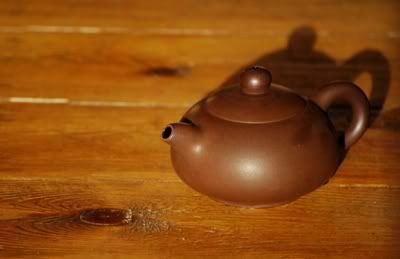 I soften them up with a little warm water so that they can be eased into Zidu [my fat little teapot] without breaking. The image above shows the soup to be rather orange, whereas it only turns this colour after being left out in the air for a minute. 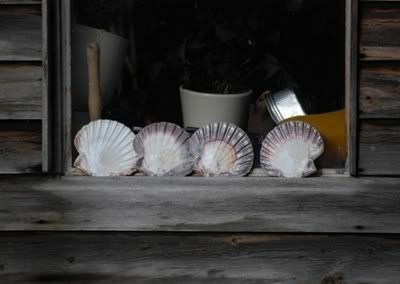 Straight out of the pot, it is a charming yellow hue - a thin, translucent yellow that reminds me of crisp French Chardonnay. The aroma of the soup is a bold, punchy sweetness of complex sugars - it hangs forever in the nose. 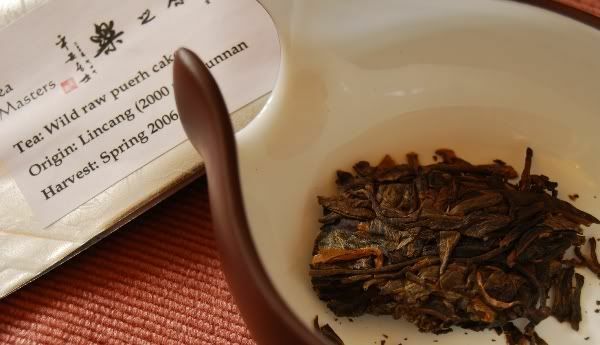 Maocha can tend towards the simple, which is not a bad thing, though this particular example shows a fine range of long, sweet flavours that remind me of sweet leather. The first thing I notice with this tea is its vibrancy, filling the mouth with energy and liveliness. The huigan [returning sweetness] lands in the throat with a resonating mushroom aroma in the back of the nose. After a good night's sleep, this session early on a Sunday morning leaves me feeling clean, fresh, and alert. It is a good time to drink shengpu. If the Laobanzhang was all mushroom, this Xinbanzhang is perhaps more sweet, though they are birds of a very close feather. Given the close proximity of Lao- and Xinbanzhang, perhaps that shouldn't be surprising. 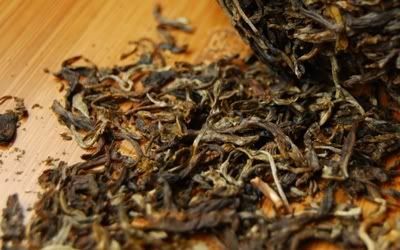 I imagine that many unscrupulous producers use leaves from areas nearby to Laobanzhang and claim them as being the real thing. However, my little encounter with this lovely maocha reminds me that it might not be a bad thing, at least from the perspective of the tea's quality, if not it's price. Thanks again to Nada for another instructive and enjoyable session. An unsung hero: Zidi [purple belly], my principal teapot. 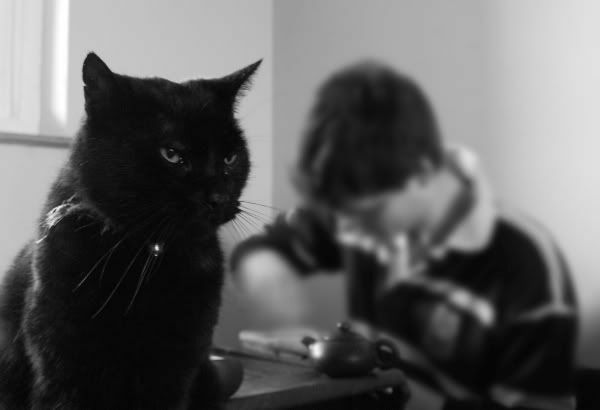 I use him to brew shengpu, mostly of a young or middle-aged variety. At around 12cl, he's large enough for a good session. (When faced with older teas, I edge down to a smaller 8cl pot, so that I can use a smaller amount of leaves.) Zidu is my fat little friend, and he makes a very decent brew these days. Into Zidu's ever-hungry belly today goes some 2003 Xiaguan. I feel like I've been drinking rather a lot from this producer recently, but perhaps that's just because I rather like their approach. I don't have much non-modern Xiaguan, excepting a few mature examples, and this 2003 cake is a nice change of pace. "Teji" means "first grade". Perversely enough, there are usually lots of grades above "first", for most factories, usually combinations of the phrases "imperial", "tribute", "golden", "reserve", etc., etc. This is old-school Xiaguan: small fragments of small leaves, with a simple and gentle aroma of sweetness. 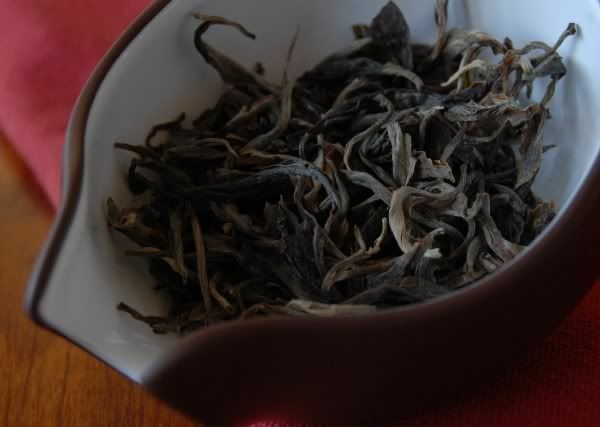 It's a dark-looking sample (shown above), obtained from Yunnan Sourcing. 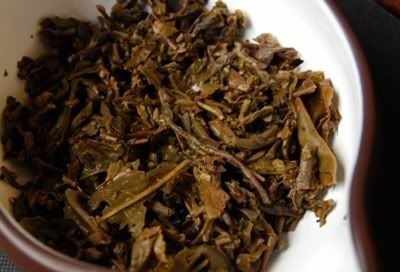 There's always lots of leftover leaf material from a Xiaguan (pictured below), and it's good to separate out the fannings, unless you're deliberately trying to increase the punchiness in the initial infusions - and with the fragmented nature of traditional Xiaguan, that's probably not a wise idea. I don't lament that this tea is no longer for sale, though it is not unpleasant. 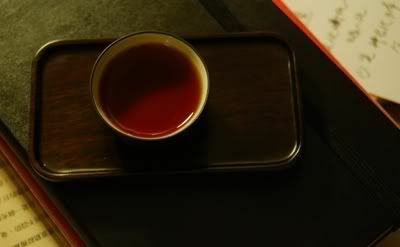 Perhaps a touch muted in actual character, as "red" teas invariably become, I wonder if such oxidation is becoming a little too common. 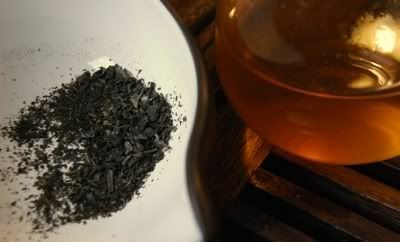 Correspondingly, for a chopped tea, its bitterness is highly restrained: this is often the first thing to go when the producer opts for a little hongcha-like addition to the flavour. In what appears to be an increasingly-common phenomenon, I failed to notice that I already have written about this tea (here)! 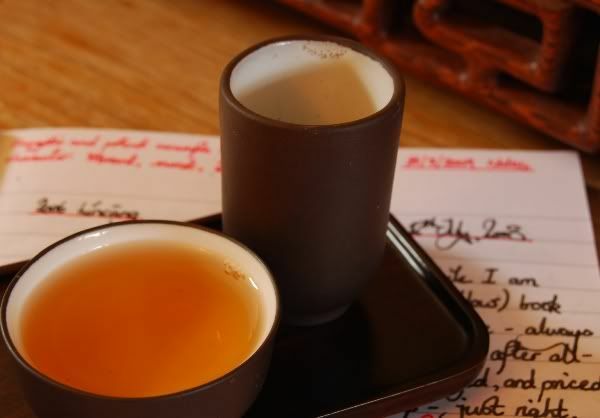 Amusingly enough in that article, I likened the hongcha-like notes to Assam or Nilgiri. "Not one for my collection", I wrote, and I'll stick by that. I'm always a little sad to say goodbye to a good sample, especially when the tea is either no longer available, or prohibitively expensive. So it is with this sample of 2006 Lincang, from Teamasters, which I've been drinking on and off for the last year, and which has come to the end of its sample-packet. The leaves look a great deal more red in the above photograph than they are in reality, but you can see that there is a good mix of leaf grades, from tips to stems, and the whole blend looks very appealing. "The first bite is taken with the eye." The dry leaves have a lovely aroma of pungent sweetness that fills me with hope. The brew is a touch orange - certainly moreso than one would expect from a tea barely three years old. Pictured below, my original page of notes from last summer, which I update by scribbling all over the tip in pens of different colours. This tea is quite a conundrum. 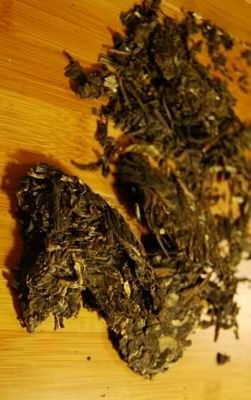 In the first infusions, it is delicious: enjoyable and complex, with plenty of the sweetness that I associate with Lincang leaves. 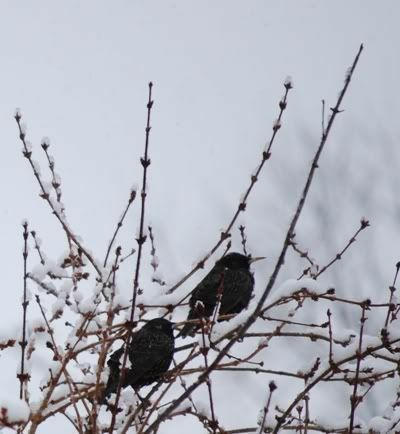 It has a fine silken texture, and the manner in which it almost effervesces on the tongue is unmissable. By the third infusion, lots of "purple" fruitiness has appeared, similar to those leaves in which some cheeky processing has occurred. The sweetness comes to the fore, and the complexity of the first few infusions fades away. By the sixth infusion, it has become quite bitter and rough, despite conservative brewing. Ever simpler, I wonder where the charm of those first few infusions has gone. Turning out the leaves, we can see from the above photograph that something has occurred here - the blend is an interesting one. 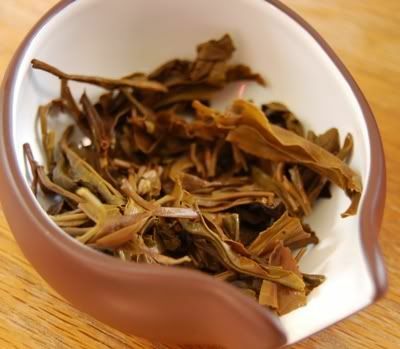 The "mountain" flavour that I so enjoyed in the first infusions could perhaps come from a portion of untreated, good leaves, while the rough simplicity of the later brews could be down to the portion of other leaves. It's a puzzler. Certainly, there can be no denying the beauty of some of these sizeable leaves. I've had some thoroughly enjoyable sessions with this sample over the last year, primarily due to the overwhelming charm of its early character. Perhaps time might benefit the character found in those latter stages... but that's an experiment for someone else. 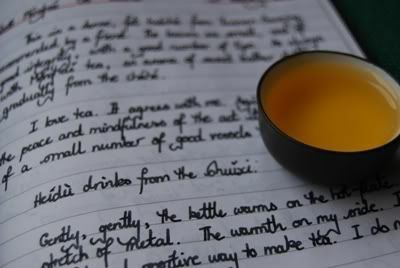 After publishing my notes on this tea, I discovered a very similar 2006 Lincang tea in my index! 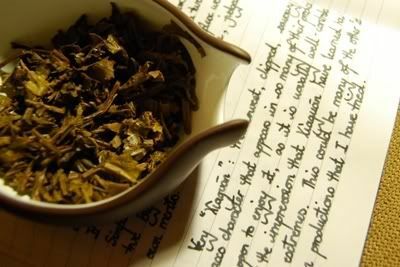 Surely, this must be the same tea, looking at the size of the leaves, my description of vibrancy, and the monotonic simplicity observed in both sets of notes. Revisiting this tea has left me less enthusiastic than I appear to have been in my original notes, but it is heartening to see that some observations are common to both articles. I recall that Lei loved that original photograph of the leaves taken on the wicker mat, and I must remember to revisit it! This charming fellow arrived some weeks back. Packed in tissue paper, wound wround in plastic-wrap, put into a wooden box, wrapped in gift-paper, tied with a bow, wrapped in tissue paper, wrapped in bubble-wrap, placed in a cardboard box and padded with air-cushions, this was perhaps the most well-wrapped item I have ever received. I take the acquisition of teaware very seriously, not wanting to accumulate redundant clutter, and our configuration hasn't changed in over a year: same pots, same cups, same kettles. 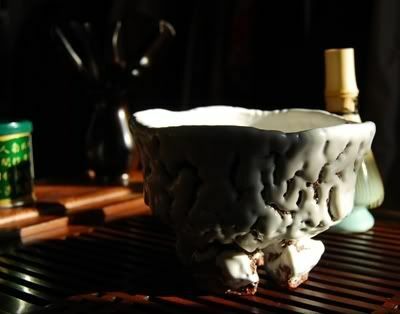 Realising that the consumption of matcha really requires something a little more apropos, and given our tastes for all things wabi-sabi, there was no real alternative to this charming chawan [tea-bowl] for us. I can heartily recommend Magokorodo, the popular eBay shop from which this was bought. The bowl feels dense and good in the hands. Fans of Japanese teaware will know that this is hagiyaki [Hagi-style teaware] - this particular white-glaze genre of Hagiyaki is "oni" [ghost]. This is a rather unfortunate character in Chinese, but perhaps not so in Japanese. 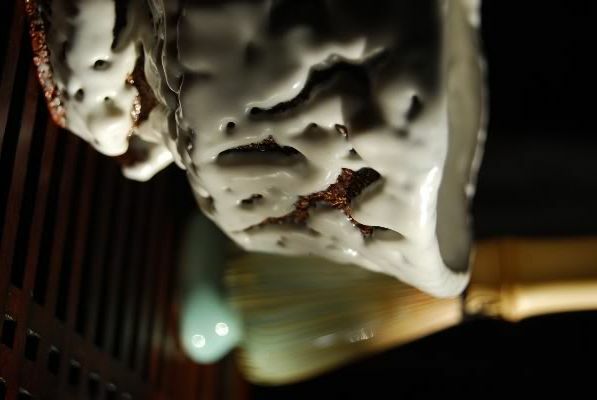 It is a piece by Seigan Yamane (Seigan being his family name, written in the Oriental manner with surname first), a potter currently in his late 50s, well-known for his Hagiyaki and, in particular, the lovely blue pieces recently exhibited by Alex and Brent. We've been enjoying morning matcha since being enthused to do so after a recent trip to the British Museum, and feeling all the better for it. Seigan's hagiyaki makes that experience all the more pleasing. I am a maniacal whisker. Induction heating is 95% voodoo, 5% science. I hope that you will permit me to tackle a few misconceptions, including some particularly amusing ones in the Art of Tea magazine which VL may remember (though I've not bought this after the 3rd issue). I offer you the briefest of introductions to the black art of boiling your tea-water via induction. The main idea is that you have an electromagnetic coil tucked away in the base of your cooker (#1, in the figure). Most of the tea-inductors I've seen are made by Kamjove, and I've used one of those myself for about three years (though have recently changed to a hot-plate). It's primary benefit is that it's quick, because it's efficient. Run some alternating current (a.c.) through the coil and, in accordance with the Biot-Savart law, you'll generate a magnetic field, as is well-loved by most physics classes in school. This magnetic field passes up from the coil, through the ceramic hot-plate sitting on top of your cooker, and into the metallic structure of your kettle (#2 in the figure). Remember that the current was a.c., so it's cycling positive and negative; and so, the magnetic field is cycling at the same frequency. Nice and easy so far. The idea is, of course, to heat the water (#3 in the figure). This can happen in two ways, depending on what your kettle's made from. When you pull your oar through the water, you leave behind swirling vortices, persistent turbulence. When the magnetic field flickers on and off in the pot, you get an electric current induced in it (according to Faraday's law), circulating much like that persistent turblence caused by the oar. As every user of the light bulb will know, running current through metal causes heat to arise through resistance. This heat can be used to get your water boiling. Check out the graph below. I know that most normal people are allergic to graphs, but hang in there. This is what's happening as that magnetic field goes on and off in your kettle. That field is shown on the horizontal axis in the figure: "field strength". We start at P1. As the field gets stronger, that magnetic field is set up in the kettle. We can see the "flux density" (on the vertical axis) increasing as we increase the field strength, moving along that dashed line until we reach a maximum at P2. In fact, we have to reverse the field strength in order to get the flux density in the kettle down to zero again (P4). 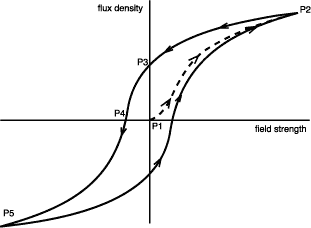 We reverse the field strength to its minimum (P5), and the flux density reaches its minimum. As we continue the cycle around once more (from P5 to P2), the flux density follows it as before - but "lagged". This cycle goes around and around as the a.c. current cycles between positive and negative. This "lag" in the kettle's flux density is the hysteresis. The loop in the figure is a hysteresis loop, so called by engineering legend J.A. Ewing (although he was from the Other Place). So how is this hysteresis heating my water? The purple (lilac?) area shown above is the work done (per unit volume of your kettle's material) in getting your kettle magnetised. When we relax the magnetic field, some energy is regained - as shown by the yellow area in the above. The difference between the purple and the yellow area is energy lost in the kettle - as heat. The bigger the area between the curves (i.e., the greater the hysteresis), the more effective your kettle is at heating your water. So, induction kettles are typically made out of materials which satisfy this. The heat generated is also proportional to the frequency with which the field cycles on and off. This can be up to 20 KHz, or 20,000 flickerings per second. Some people don't like the idea of sitting next to a 20 KHz magnetic field. 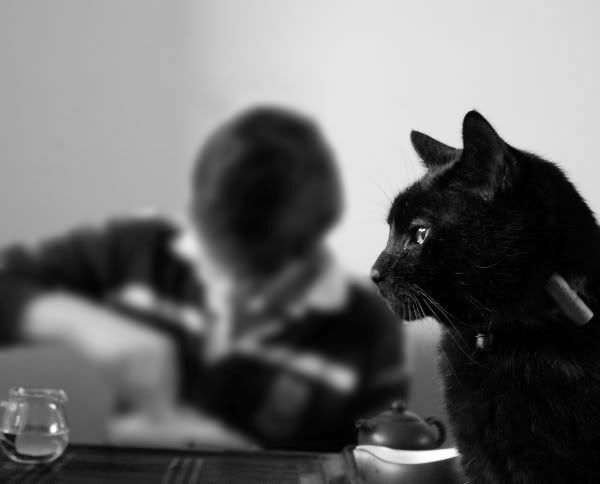 A friend visited us for tea after spending many months in a meditative retreat, and he expressed discomfort around it. "Your mileage may vary" depending on your attitude to such things. So, that's how your inductor works. "This article is so embarrassingly dull. What was that feeble human thinking?" Inductors are very efficient: very little energy leaks out of the pot into the air - most of it is transmitted into the kettle, which heats the water. In contrast, conventional hobs just get hot: they heat the kettle, because it's nearby, but lots of energy also escapes into the air. So, an induction cooker is very fast at heating water, compared to conventional heating. 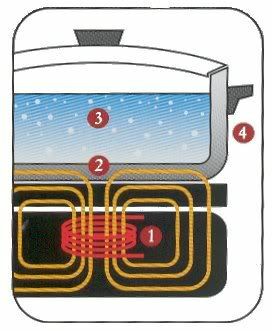 We can see that the ceramic hot-plate isn't there to heat the kettle, because that's being performed by the field - in fact, it's there's to insulate the fairly delicate induction circuitry from the hot kettle. To stop it overheating, it needs to be cooled from underneath, and so tea-versions usually have a noisy fan roaring away. I don't like this about induction cookers. It really ruins the tea atmosphere. Induction also has lots of other fun applications: as the water heats, the characteristics of the field change, which can be sensed by the induction unit, and so the field can be changed to compensate. This allegedly leads to induction kettles with temperature control - but they're usually fairly horrible. I've not seen one that I could trust so far, and it's infinitely easier (and more reliable) just to learn it yourself - and more satisfying. Induction also requires some resilient materials. The magnetic field is always set up in the same way, and the location of the most heated areas is concentrated spatially - it's not an "all over" heat, like a conventional hot-plate would provide, but appears in regular "hot spots". You're heating the base of your vessel in a fixed pattern, repeatedly, and the (really rather significant) temperature differential across the metallic lattice can lead to stress fractures. Don't put your expensive Japanese kettle on an induction hob! So, that's induction. If you knew it all already, do please correct me where I'm wrong. If you didn't know (or care to know), then I hope it's been useful in some small way. Either way, I hope I don't read any more stories about electricity passing through the water to heat it up! 1996 Menghai 7532 "Green in Orange"
With cause to celebrate, I crack into a sample bought from Nadacha: the mighty 7532 from 1996. This is the "Green in Orange", referring to the fact that the cake has a green neifei [ticket embedded into the cake], while the wrapper has an orange "zhongcha" logo. 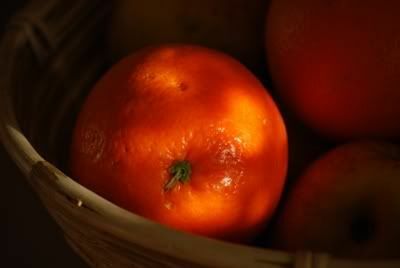 This is a later blend from the year to the 7532 "Orange in Orange" which, unsurprisingly, has an orange neifei. This cake costs £200, which I'm unlikely to be able to justify spending on a single cake, even if it does work out to be quite cheap per session. So, time to enjoy a sample while it lasts! This is desirable tea. If my 7532 from this year age so well, I will be a happy tea-drinker. It's fascinating to compare 7532 from 1996 to 7532 from 2009. It allows us to try and extrapolate from existing characteristics to what may be observed in the more mature leaves - making the fairly strong assumption that the two are comparable in production. The leaves, pictured above, are small once again, and the pleasant rusty orange of tips that have gained some maturity. While dry, the aroma is asleep. When added to the rinsed pot, it awakens to reveal beautifully rich, damp, sweet wood. Oh, this one is smooth - so very, very smooth! 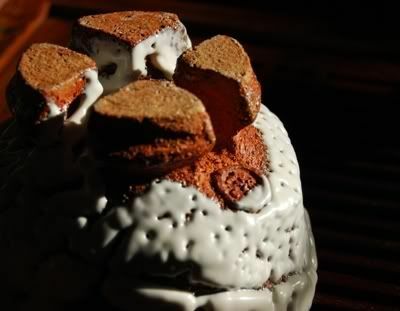 It opens with plenty of sweet vanilla in the wenxiangbei [aroma cup], while the soup is heavy in its red/brown colour. It has a golden meniscus, a sign of aging shengpu. 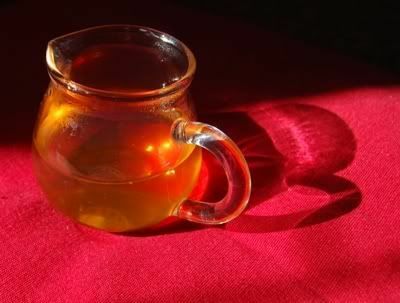 This tea is alive, and it cools the lips and causes tingling sensations on the tongue. The huigan builds, and endures for a whole minute. This cake is a real treat. The surprising smoothness is remarkable, and that citrus-like tang of 7532 lives on despite its years, but attenuated and smoothed out, becoming part of the rich, woody background. 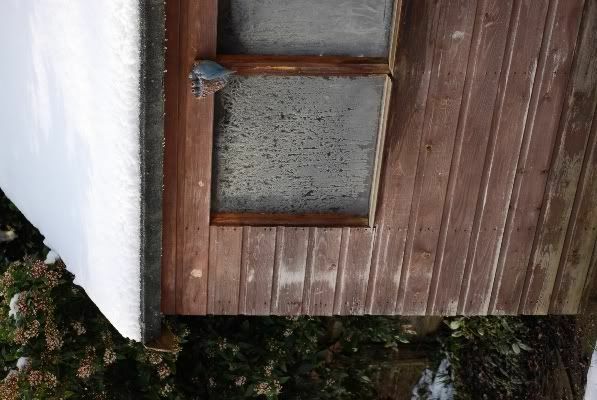 The birds living around our new house are picky little blighters. 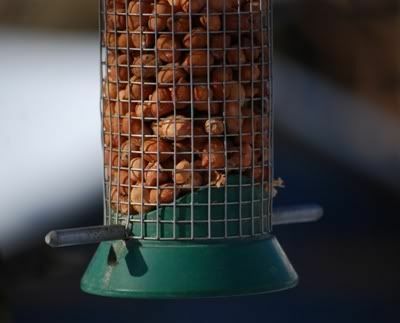 They demand only the finest nuts, and refuse any other treats that birds from our previous residences would have scarfed in moments. Perhaps they just live in fear of Heidu (a cat who does not even belong to us), and so they only touch down when it's really worth their while. Either way, I think I deserve some good tea. This fat little fellow came strongly recommended by "Thanks" - so, thanks! 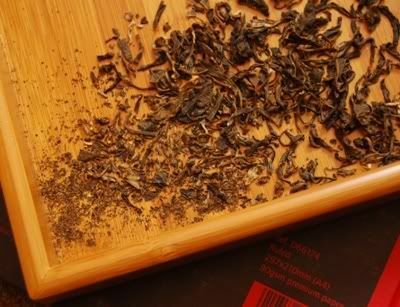 He wrote so passionately about this tuocha that I couldn't help myself, and had to grab some from Yunnan Sourcing, where it costs about as much as two pints of decent (i.e., English) beer. It's so endearingly chubby, as you can see for yourself. It's pudgy, cheeky character reminds me of Chunk, from "The Goonies". I suppose he's an old man by now, but in the popular imagination, he will always be the short, rotund rebel from that film. What a great way to be remembered. Taking the pu'erdao to the side of "Chunk" releases a stream of easily-separated leaves, courtesy of the comfortable compression. By the power of Greyskull, this is actually good tea. About time, too, given the recent run of ho-hum mediocrity! As always with the more standard Menghai productions, this has a bouquet of sweet leather. As hoped, the soup is a charming yellow, full of the chunkiness of the original leaves with a potent aroma of sweetness. Sweetness, huigan, an aftertaste of mushroom - the usual suspects are all here in good quantity, but presented in a punchy, raunchy manner that testifies to the end of the watery 2006-07 era. Unexpected for Menghai, there is a yunxiang [after-aroma] of wildflowers: something that reminds me of rugged flora. Even some notes of complex, rough honey creep into later infusions. 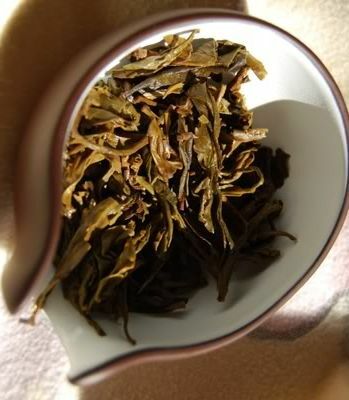 Expecting a fat, modern tuocha to be bitter, I was conservative with my selection of leaves, and in brewing, which turned out to be sensible. It was on the verge of turning into something unpalatable, but remained on this side of the curtain, and was all the better for it. Spend $8 with any other factory and try and achieve this level of chubby satisfaction, I challenge you! 2006 Yiwuzhengshan "Douji Yiwushan Qiaomu"
Our fig tree is growing! It's... alive! To celebrate the coming of spring, I dipped into a Douji cake that I've had since last autumn. I like Douji, very much. 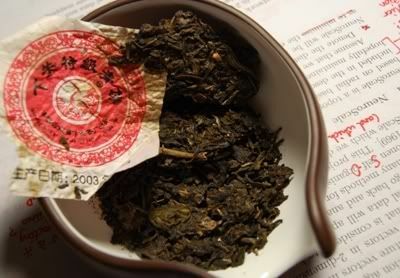 The 2006 Daye Qingbing [big-leaf sheng-cake] is one of my favourites, and though they've been more variable lately, the inexpensive Dadou and Shengdou bricks were not too bad (primarily because they reminded me of that 2006 Daye Qingbing). 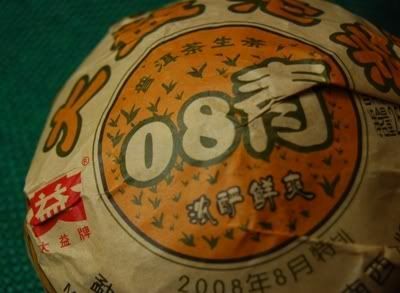 Whereas the 2006 Daye Qingbing cost £12, when it was in stock, this sister cake from 2006 costs £15. Is it worth the extra £3? Frankly, even if it's only slightly similar to my dear old Daye Qingbing, I'd be happy to buy some. Out of the wrapper, and the game is definitely still on: it looks decent, as shown below, with white furry tips, and some yellow leaves. I have no problem with eclectic blends, and tend to believe that they add complexity. 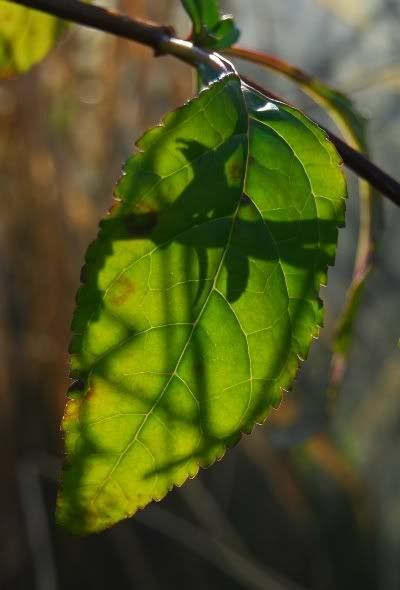 The scent of the dry leaves is that of soft, rich tobacco. I spend a great deal of time dwelling on it. This surely must be a good cake! Thankfully, the soup (pictured below) turns out a fine yellow hue, which is sugary and fresh in aroma, with good duration. What a shame that I went on and tasted it. While my first impression is positive, given that it is highly energetic and active around the mouth, it is lacking real flavour. It has a decent honeyed sweetness, and a mouth-watering finish - yet it's all empty, one-dimensional, and a bit of a disappointment. Plenty of high sweetness... but not much else. 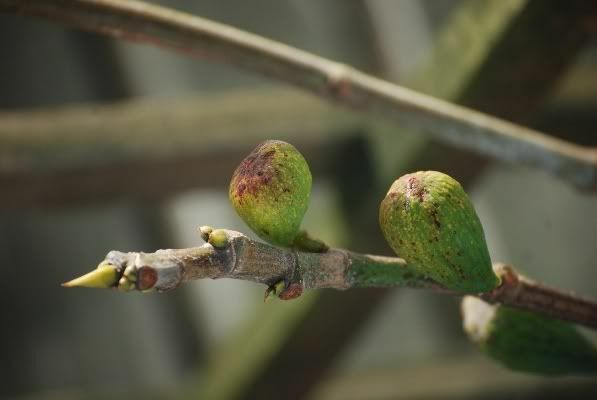 Clearly, it has been produced from leaves of decent quality, as may be seen above - they are healthy and strong. I wonder if it simply requires a stronger hand, yet pushing the tea brings out only roughness and green acidity, rather than anything complex or otherwise pleasing. It promised so much, yet delivered so little, and thus this cake is consigned to sit on my shelves to be revisited in a year or so. Little miracles can happen! If this is "qiaomu", then I'm a monkey's uncle. I remember one of the first tea vendors we ever met (who subsequently made a fair amount of money out of our ignorance of tea at the time) was a chap in Chengdu. Though I've forgiven him his excessive price-gouging, which in all fairness was the fault of my own ignorance to fall for it, I still recall one thing he told Lei and me. "You drink shupu in winter, and shengpu in summer. 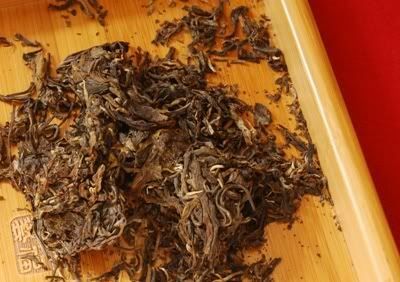 If you drink shengpu in winter, people will think you don't know anything." 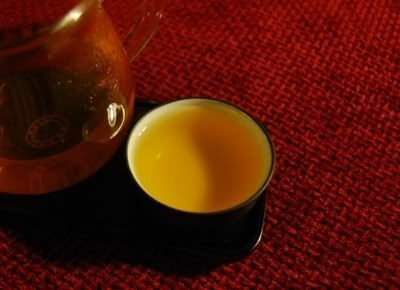 This maocha was kindly provided by RJo'C, who obtained it from Nadacha. A large portion of this tea costs about as much as a loaf of bread, and so isn't really something that I should overanalyse. For something so low in price, it looks very appealing. I don't remember finding anything like as good for the price during my last round in Maliandao, but Nada's bargaining skills are, in all likelihood, better than mine. At least, I hope they are, because if they're worse than mine, he's in the wrong business! My friend BR was amused when I got my Chinese numbers muddled in the Maliandao Chayuan and actually bartered the price of a celadon teaset that he wanted to buy up from its original price. It's a yellow beast, as one would hope from maocha. It is fruity and sweet, if a little "brown" in flavour (referring to that "browning" effect on flavour that occurs if one were to leave something out in the air for too long). Simple and energetic, if forgettable - but for the price of a loaf of bread, who's counting? It packs quite a punch, and I imagine that I'd keep it in my office for an undemanding morning pick-me-up if I had this in any quantity. 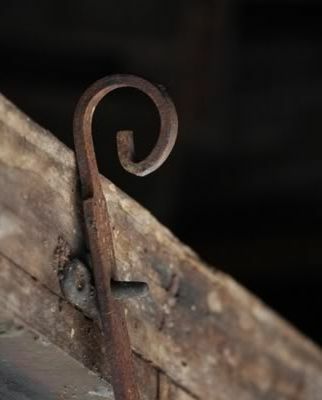 I like old things, knackered things, decrepit wastrels, and dented, battered items of all kinds. 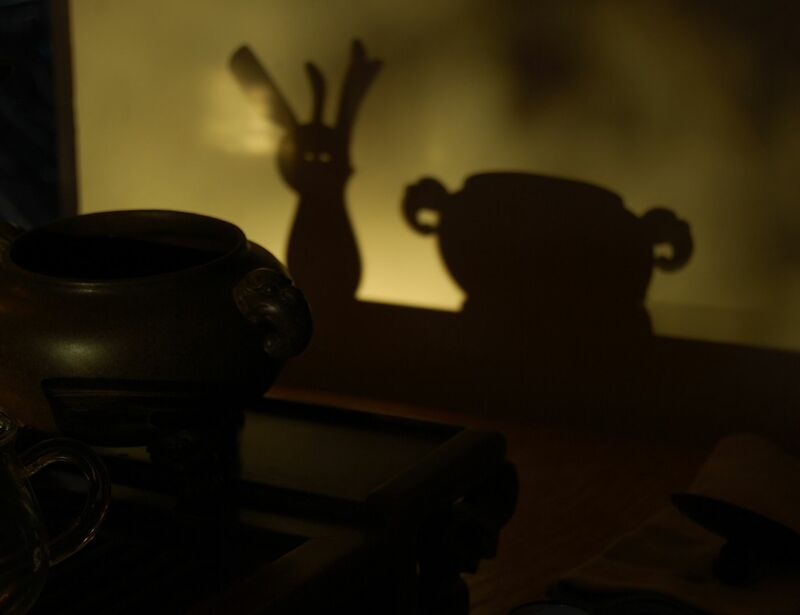 There's something definitely sabi and perhaps even a little wabi about such artifacts. So, I was fully geared up for nostalgic rapture when faced with this inexpensive tuocha from the 1990s, bought from Nadacha. At just £15, bijou alarms bells were ringing, but I silenced them soon enough. Wrapper-less and naked, it reclined in louche fashion all pouting desirability and potential charms. However, it had absolutely no aroma of any kind. 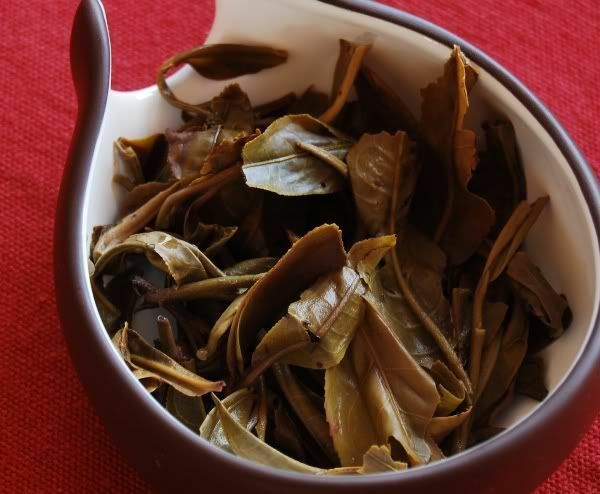 I was taken aback by the size and integrity of the leaves, being accustomed to the usual Xiaguan-esque ubermulch from which tuocha are typically constructed. This example has some long, luxurious leaves in its blend (pictured below). 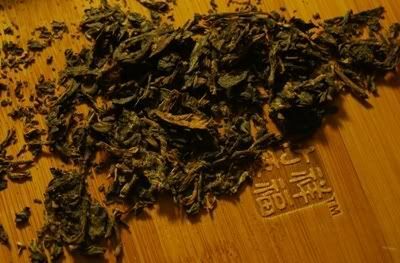 Even after rinsing, the aroma is quiet - excepting whopping great big quantities of shicang [wet storehouse]. 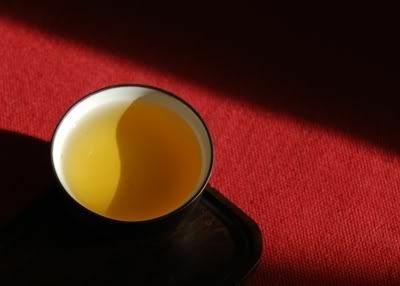 While the soup comes out a deep orange-brown, indicating that it has not reached the depth of "proper old pu'er", it looks pleasant. 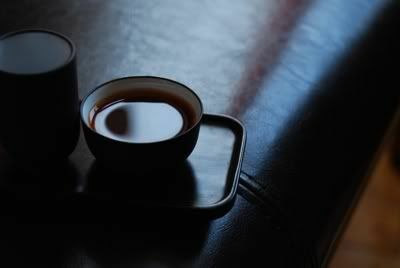 Concerningly, the aroma in the wenxiangbei [aroma cup] is merely... warm. Perhaps, in the distance, a little vague sweetness. 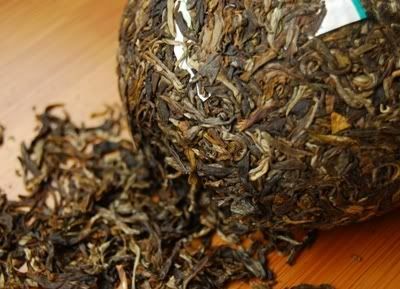 I was not conservative with the quantity of leaf, given the quietness of the dry leaves, and so the body of the tea has a thick texture. However, it is absent much in the way of charm or flavour, delivering a faint shicang sweetness - but otherwise, very little. This emptiness was quite a surprise. As infusions passed, it did evolve into a slightly more pronounced sweetness, but I found myself having to perform extraordinarily long infusions almost from the start in order to coax much out of this reticent fellow. In order to obtain flavour, I had to begin overlapping my infusions after the fourth: letting the next brew while I enjoyed the current one. The fifth infusion entirely blocked my filter! 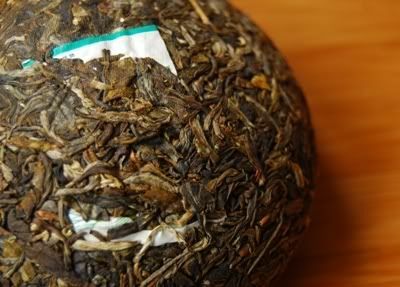 I didn't fair well with this tea, despite its abnormally chunky leaves (shown below). 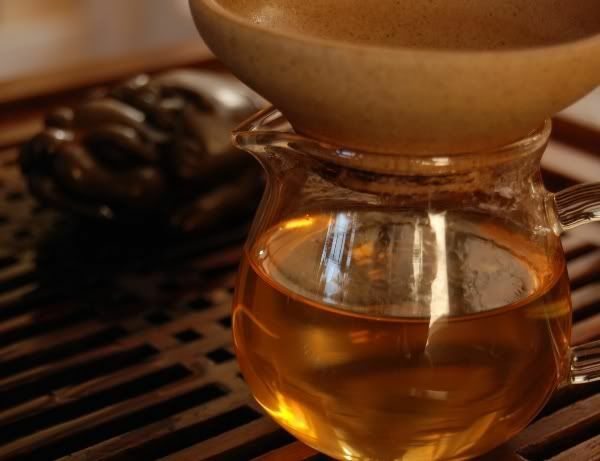 What this tea does have is a very pleasant, calming chaqi. It soothes, hums a lullaby, and almost causes me to slide into slumber. Fairly priced, and perhaps interesting for its chaqi, I didn't find much to excite me in this little chap. Later infusions (10+) show a roughness in the throat that didn't really endear itself to me. 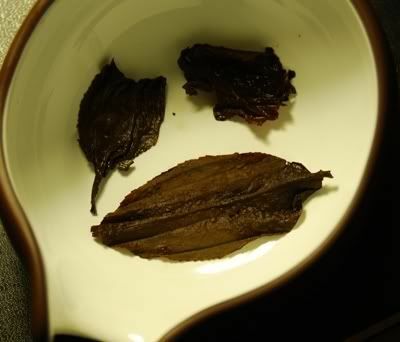 This tea reminded me of tired old wet-stored maocha. Sabi only goes so far - the item has to be solid. 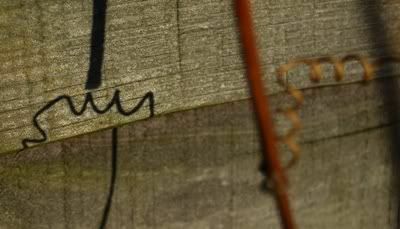 It is a good lesson in what storage should not be: an erosion, an exhaustion, an expiration.